One of the best financial moves I made had very little actual net worth impact, but significantly improved my quality of life. After Bubelah and I got married, we did a quick inventory of our bank accounts, credit cards and brokerage accounts. I don’t remember the exact numbers, but between us we had at least four bank accounts, 20+ credit cards and approximately 12 brokerage accounts (and I’m including company 401(k) plans, IRAs and so forth). I had three direct-investment stock plans where the stock was held by the company, too. We chose our bank for our business and personal checking for two reasons: they have a large number of physical locations in the New York City metropolitan area and their account fees were reasonable (basically free checking). I could not think of any particular reasons to go with another bank, simply because we saw their branches everywhere, and in particular several convenient to our home. The fees were fine, because as long as we maintain some reasonable minimums (approximately $500 per account) we don’t pay anything. We don’t receive interest but we try to keep a bare minimum in these accounts. We chose an online bank for our emergency fund and other savings. We could just as easily have used ING or Citibank, but at the time we decided to open an account HSBC was offering the best rates. As we have extra money in the checking account we transfer it into our online savings account. HSBC (similar to other online high yield banks) has a structure friendly to people with frugal natures. The account pays a very respectable interest rate, and it takes some small effort to withdraw funds, meaning spur-of-the-moment withdrawals are unlikely. We understand that the money in this account is not returning what our stock accounts are, but this is the conservative, worst-case scenario money so we don’t mind have a stable rate of return in exchange for very low risk. You can learn more about HSBC’s savings account here. I highly recommend it. I started moving my brokerage and IRAs before Bubelah did. I started this process because I was unhappy with my brick-and-mortar brokerage’s high commissions and awful online experience. The broker I chose, Ameritrade (now TDAmeritrade) had much lower commissions ($7.95/trade) and a much more pleasant online interaction. I am not a day trader anymore, so the commissions were not a critical factor, but I don’t rely on a broker to make trades for me and so I felt little need for expensive ‘actual person’ trading. Bubelah chose another low-cost online broker with similar commissions. We had to keep separate IRAs so we thought it would be simpler to keep one brokerage account and several IRAs linked without a lot of confusion over which account belonged to whom. Both of us had a vague fear of putting all our investment assets in one basket. While I have no reason whatsoever to worry about either of these firms, we didn’t want to be in a position where everything we hoped to use for retirement was held by one (virtual) company. Our consolidation of cards was a mixed success. The easy part was the store cards. We canceled all of them. We kept one card as our ‘main’ card. We had to keep a debit card associated with our bank account, and I had a flexible spending account card through my work. 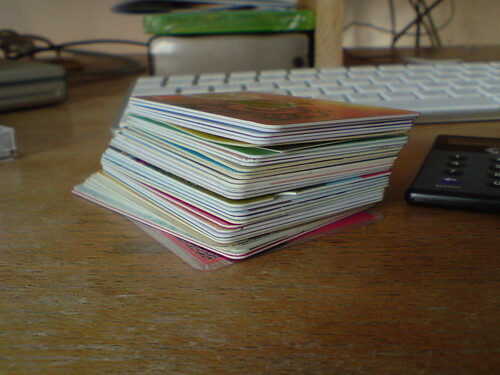 Other than that, we kept three more credit cards, for different reasons. A card for business purposes. Bubelah runs an online business so we decided we should keep any purchases necessary for the business on a separate card. We have a separate checking account at our bank, too. A ‘legacy’ card for Bubelah, because of the points. She had been using the same card for years and had accumulated a large number of points/miles on the card, and wasn’t willing to lose them all. Plus, it was in her name alone and we decided it made sense for us each to have our “own” card which would not be a joint account. One card in my name only, for the same reason – I wanted something in my name only, because other than this card every single thing we own is joint. The biggest benefit to the whole process is saving time and increasing awareness of spending. When you get one huge bill each month and know you have to pay it off in full, it makes you think twice before spending. We always pay the entire balance each month, so it’s almost like spending cash. However, you get spreadsheet downloads showing when/where/what you bought, and you get points which we have used to save thousands on hotels, flights and so on. We have put almost all of our spending on the card, including automatic charges (cell phones, utilities, etc.). I think it helps to see all of your spending in one place, and it greatly simplifies bill-paying at the end of the month. We only write 1 physical check each month. All of our other spending is through automatic bill payment on our bank or through our main card. Even the mortgage is automatically withdrawn. If you haven’t already considered consolidating your accounts, consider this: it will take a tremendous amount of time to track down all of your information, move your accounts (particularly investment accounts) and close unneeded ones, but the time savings on the other end of this process are tremendous. Where once we spent hours flipping through paper bills for our dozen credit cards and trying to figure out which account to pay it out of, we now just automatically pay our one credit card and get two statements for our investments. We have a clearer picture of our spending by seeing it summarized in one credit card per month. I believe anyone could benefit from making their finances simpler and reducing the time spent on them.